What is the story of Kedarnath Jyotirlinga? Lord Shiva has been worshipped in Linga form from time beginning as described in answer here. Among the Lingas there are 12 Jyotirlingas which are of special importance. Somanath in Saurashtra, Mallikarjuna in Shri Saile, Mahakala in Ujjaiyana and Parameshawara also manifested as Omkara. Kedara in Himavat and Bhima Shankara in Dakinya. Vishewaswara in Varanasi and Trayambaka in side of Gautami. Vaidyanath in ChitaBhumi and Nageshwara in forest of Daruka. Rameshwara in Setubandha and Ghusmeshwara in Shivalaya. These name of 12 Jyotirlingas who recites in morning, he gets freed from all sins and is eligible to get all Siddhis. There are twelve Jyotirlingas mentioned in the similar popular verse. I have already asked a question about Somanath What is the story of Somanath Jyotirlinga? and Mallikarjun What is the story of Mallikarjuna Jyotirlinga? and Mahakaleshwar What is the story of Mahakaleshwar Jyotirlinga? and Omkareshwar What is the story of Omkareshwar Jyotirlinga? and Vaidyanath What is the story of Vaidyanath Jyotirlinga? and Bheemshankar What is the story of Bheemshankar Jyotirlinga? and Rameshwaram What is the story of Rameshwaram Jyotirlinga? and Nageshwar What is the story of Nageshwar Jyotirlinga? and Vishwanatha What is the story of Kasi Vishwanatha Jyotirlinga? and Trayambakeshwara What is the story of Trayambakeshwara Jyotirlinga?. Now I want to know the story of Kedarnath Jyotirling. Please mention the scriptural reference. 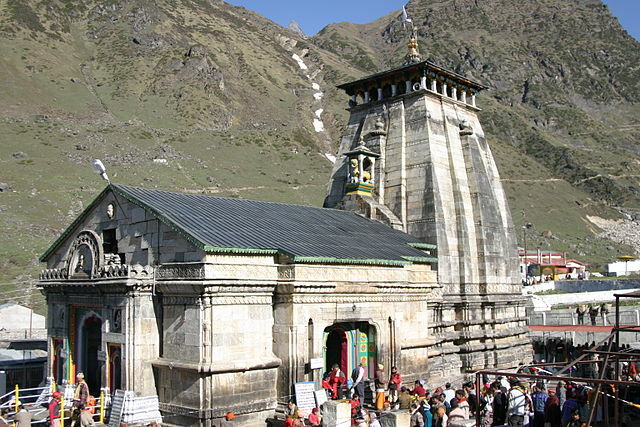 Kedarnath temple is situated in Uttarakhand. Nara-Narayana were two prominent sages, who were sons of Yama and previous births of Arjuna and Krishna respectively. They lived in Badrikashrama and they were known for their fight with Sahasrakavacha. These sages did Tapasya for Lord Shiva daily and Shiva used to come here as Parthiva Linga pleased by their blessings. He stayed there as Kedarnatha Jyotirlinga. The story of Kedarnatha Jyotirlinga is described in Chapter 19 Kotirudra Samhita of Shiva Purana. Sūta said, “Nara-Nārāyaņa, the two incarnations of Visnu, are performing penance at Badrikāśrama Khanda in Bhārata-varsa. Śiva, in order to accept their worship of the Pärthiva-linga arrives there daily. This is because Siva is always subservient to his devotees arrives there daily. This is because Siva is always subservient to his devotees. Those two incarnations of Visnu, and spiritual sons of Śiva, adored Siva there for a long time. At these words of Šiva, Nara-Nārāyana, spoke to Śiva, keeping in view the welfare of the world. Nara-Nārāyana said, “O Lord of gods, in case you are pleased with us and intend to bestow a boon, then you stay here forever for our adoration. Sūta said, “When both of them thus spoke, Šiva got himself established over the snow clad Kedara mountain, in Jyotirlinga. The linga, having been adored by both of them (Nara-Nārāyaņa) the linga, which removed all types of dangers and pains, for the benefit of the people and for the devotees to have a look at it, was lodged, there, which could be seen even today. Śiva is found present there in the form of Kedaresvara. The lord fulfills the desires of all who have an audience with the linga or worship it. Not the answer you're looking for? Browse other questions tagged shiva scripture temple shiva-lingam jyotirlinga . Why is Shiva called “Bholenath”, Bhootnath, Amarnath, Kedarnath, Omakara etc.? What is the story of Mallikarjuna Jyotirlinga? What is the story of Rameshwaram Jyotirlinga? What is the story of Nageshwar Jyotirlinga? What is the story of Vaidyanath Jyotirlinga? What is the story of Mahakaleshwar Jyotirlinga? What is the story of Omkareshwar Jyotirlinga? What is the story of Bheemshankar Jyotirlinga? What is the story of Trayambakeshwara Jyotirlinga? What is the story of Ghushmeshwara Jyotirlinga?